From time to time, we all experience the feeling of a deep, painful aching in our joints and muscles. This can be due to phenomena such as age, cold weather, or general every day wear and tear to our bodies. Peeled Orange care deeply about your well being, and we have carefully and painstakingly selected the active ingredients in Peeled Orange Aromatherapy Intensive Heat massage oil. Containing Ginger, Clove Bud, Black Pepper and Cumin, Peeled Orange Intensive Heat will energize and invigorate those nagging muscles and joints. 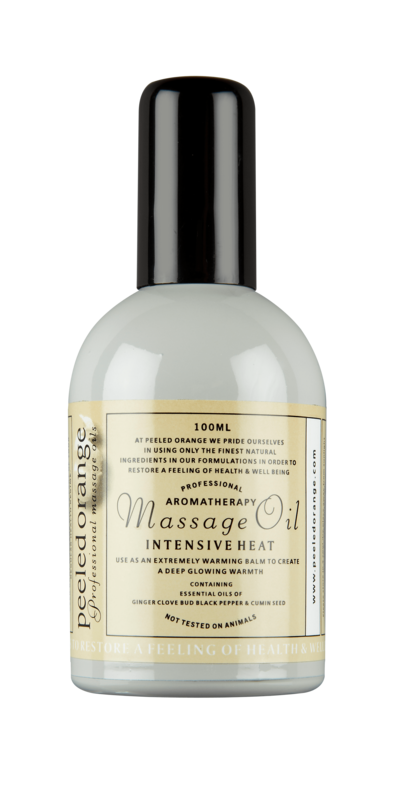 Described by one aromatherapist as being 'the best oil I have ever used' and having 'an almost thermostatic control of its heat giving properties' Peeled Orange Intensive Heat is a heavy, smoky, liqueur-like elixir, giving warmth and relief where required. We can highly recommend receiving a treatment from a professional therapist using Peeled Orange Intensive Heat. Ginger has been highly revered by Chinese herbal therapists for thousands of years. Holistic practitioners use Ginger to energise and stimulate by creating a deep, glowing warmth on the body. Pure essential oil of ginger is an excellent oil, used to tone and revive stiff joints and limbs. The sharp and spicy aroma of Black Pepper is an essential ingredient in peeled orange Intensive Heat. It soothes and energises tired limbs and stiff joints and creates a luminous, glowing warmth to the body. When your body needs a deep glowing warmth to aid your comfort and well-being, Peeled Orange Intensive Heat is the tonic you have been waiting for. Used to great effect by aromatherapists, Cumin is a deeply warming and penetrating oil. Being rubefacient, it is able to stimulate and revive stiff tired joints and will create a comforting, yet fiery warmth that your body will love. Any 2-4 blends £9.95 each+ £3.95 shipping (UK orders) Save up to £16.00!! Any 5 or more blends £9.95 each and free UK shipping Save £23.95!! Keep up to date with the latest offers and products!